There is no substitute with an album full of luscious, no-nonsense swinging music played with fierce dedication to the idiom, unadorned chiseling of classic Jazz tempo; juxtapositioning of rhythm close to, if not right inside, the melody. Most fascinating of course, throughout the music of Matrix, by the Fred Hughes Trio, is that despite the language being ‘spoken in the tradition’, it is different, with its driving, often volcanic energy, continual exploration and adventure, rapt moments of mystery and ingenious orchestration bristling with percussive harmony from both Amy Shook on bass and Frank Russo on drums. The chief surprise of this performance is how paradoxically unsurprising the surprises are, almost free of the usual clichés and idiosyncrasies or perversities that seem to pursue almost all other performances of standard tunes. Best of all Matrix is another showcase of Fred Hughes’ tense, hard-driving style, aggressive to a fault and mellow when it needs to be. Click Here to Listen to Fred talk about Matrix on Hybrid Jazz from Trish Hennessey. The interview is at the top of the show after the intro. The Fred Hughes Trio – MATRIX: OK, so you want “lively” in your jazz, right? I can tell you right now, without qualification, that this CD is the highest energy jazz release I’ve heard (yet) in 2017! The players, Fred on piano, Amy Shook on bass and Frank Russo on drums, on this January 16th, 2017 album, give you fourteen excellent performances of compositions from jazz legends like Herbie Hancock, Dave Brubeck and Horace Silver (just to name a few). As you listen to their interpretation of Silver’s “Room 608“, you’ll realize you’ve got a true jazz gem in your hands (or on your player, if you get it digitally)… truly wonderful energy going on here! The trio’s rapport is congenial as they venture off into terrain outside of the perimeters of the originals that they retool. The musicians direct the course of the tracks by milling new passages driven by their individual contributions, showing the pliability of arrangements that others have considered as being written in stone. 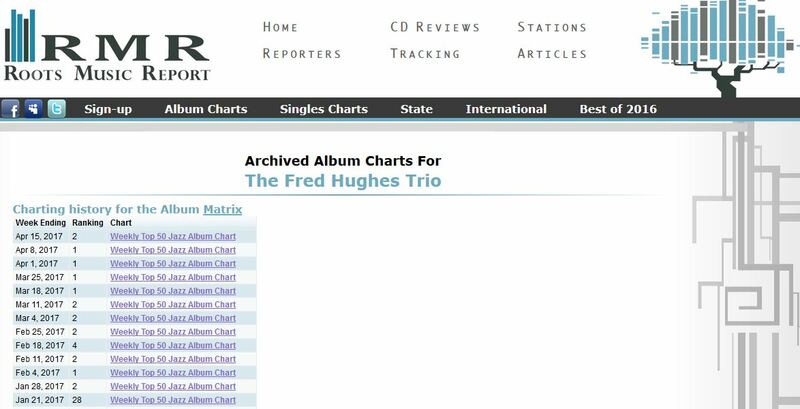 Although he has been a professional and prolific jazz pianist and educator for several decades, Matrix (Shore Thing Records – 1116) is my first exposure to the artistry of FRED HUGHES. His trio, with bassist Amy Shook and drummer Frank Russo, addresses compositions by keyboard artist ranging from Johann Sebastian Bach and Pytor Ilyich Tchaikovsky, through George Gershwin, to Bill Evans, Dave Brubeck, Horace Silver, Chick Corea and Herbie Hancock. Hughes proves to be an eclectic, delightful and wonderfully creative artist. He explores a stylistic variety of compositions with superb intelligence, endowing each selection with a unique freshness that would have delighted the creators of the music who are no longer with us, and should bring smiles to the faces of the still active Corea and Hancock. This is a thoroughly delightful collection of songs played by a trio of musicians who are consistently on the same wavelength. A delightfully swinging offering from a solid trio that swings, swings and then swings some more. But its not just the swing that makes this offering so engaging, it is the chemistry between the players, the technique and the joy you can hear in the interaction, pouring out from the notes. 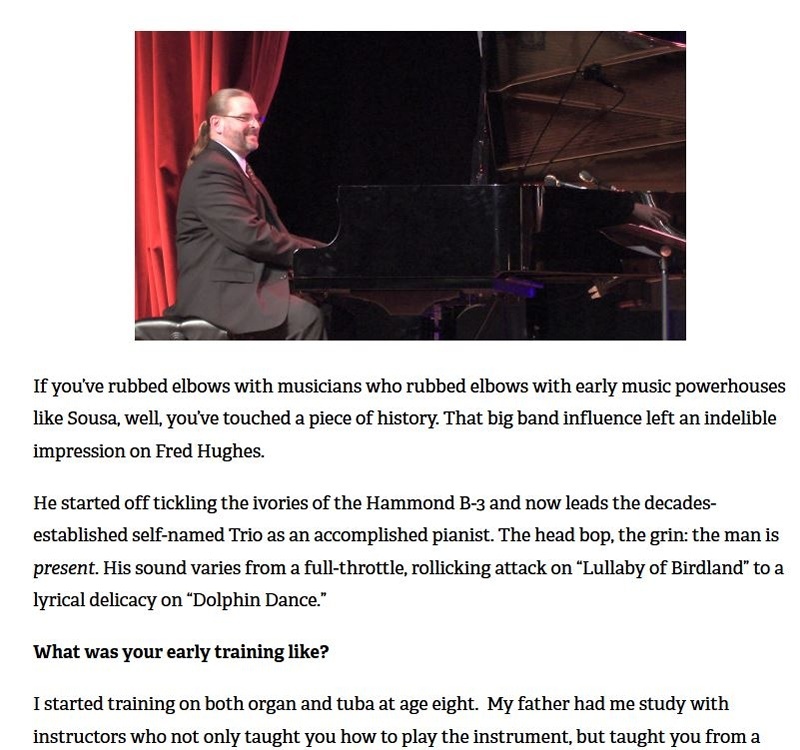 Filled with swinging solidarity, and the reimagined works of Johann Sebastian Bach, Dave Brubeck, Chick Corea, Bill Evans, George Gershwin, Herbie Hancock, Pyotr Ilyich Tchaikovsky, The Fred Hughes trio delivers a stunning formula that will leave you humming the tunes long after the disc is done playing. Solid chemistry between the players, engages the listener to a deeper experience. Not just the standard fare, but a matrix of solid performances and fluidity of ideas. Highly Recommended. Hughes really displays a command of the keys that is spectacular in his control of harmony and sense of time. Hughes possesses that ever elusive combination of heart and technique, well done maestro, well done. Hughes piano style has a clear rhythmic articulation and hard bop influence with a bright swinging feeling. He solos with a strong vocabulary of bebop and soulful blues melodies and always makes an impactful statement. 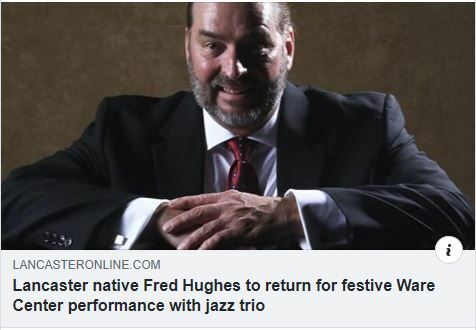 Pour yourself an eggnog or a spice tea, turn down the lights, light the candles and get into the holiday mood with the Fred Hughes Trio. A true Christmas present! Fred Hughes has been swinging since 1981. He has released many albums of great Jazz and has been a great teacher of Jazz all the while. With “I’ll Be Home for Christmas,” Hughes and his trio teaches how to enjoy the holidays, think on the holidays, and do it in a Jazz way. 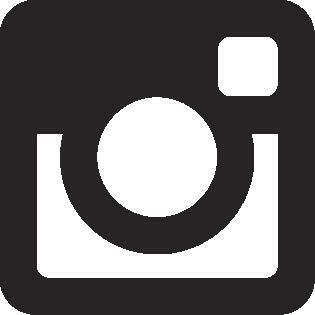 More reviews and articles can be found on the Press Page. 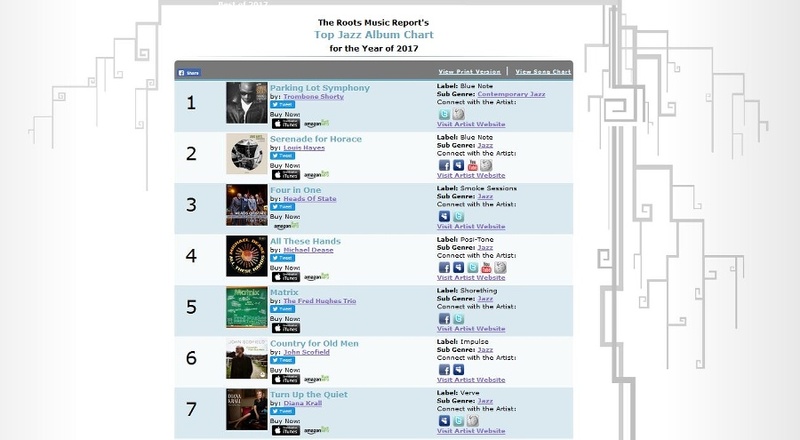 Matrix Ends 2017 in the Top 5 of the Root Music Report Top Jazz Albums for 2017! From a Satisfied Concert Goer Posting on Facebook . . . Incredible evening of music at GPAC’s Jazz in the Box featuring The Fred Hughes Trio with Fred on piano, Amy Shook on bass and Frank Russo on drums. Two sold out shows and a playlist that showed their outstanding musicianship. Audience response was overwhelming. Their latest CD “Matrix” is powerful and a must for your library. I was honored to be a guest on this two part interview with Jere B, founder and visionary at EntreMusician.com. We discussed the ups and downs of the music business and my personal experiences into mapping and creating success in the music industry. Valentine's Day focus on Love Letters.